Koreans love meat and Seoul is a great city for meat lovers. Since beef was very scarce in Korea, Koreans eat almost every part of the cow. (Check out this interesting post about the difference between the US and Korean beef cuts: here). If you’ve been to a Korean restaurant and if you’re not a vegetarian, you probably have had a Korean barbecue dish like bulgogi (marinated barbequed beef), galbi (ribs), or samgyeopsal (pork belly). But have you heard of suyuk? The name literally means “water meat,” which doesn’t sound too appetizing. And honestly, it doesn’t even taste that special. 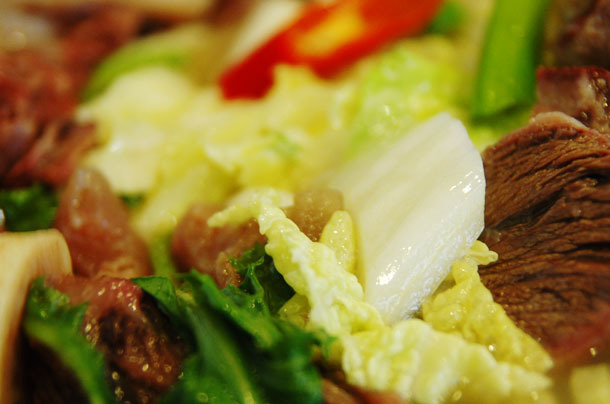 It’s boiled beef or pork that usually tastes quite bland without soy sauce or salty shrimp dip. It’s the remaining meat after making beef or pork soup. 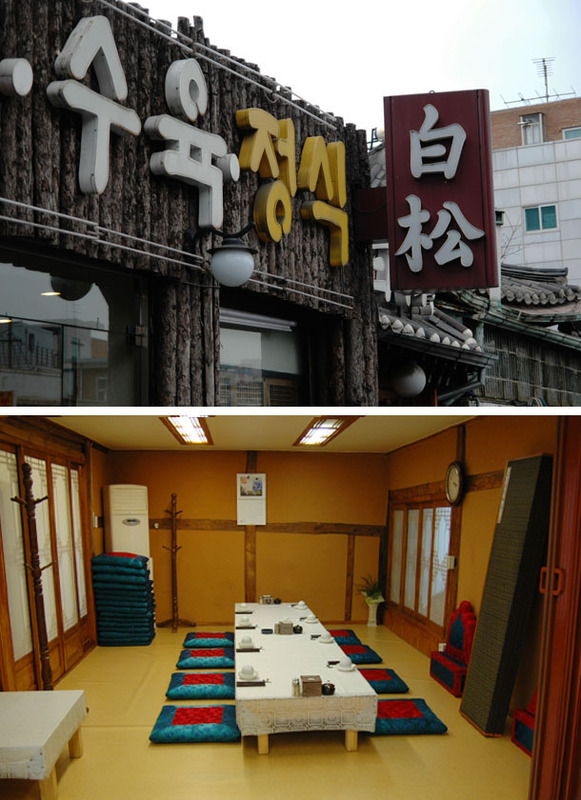 Unlike ordinary suyuk, Baeksong’s has three layers. 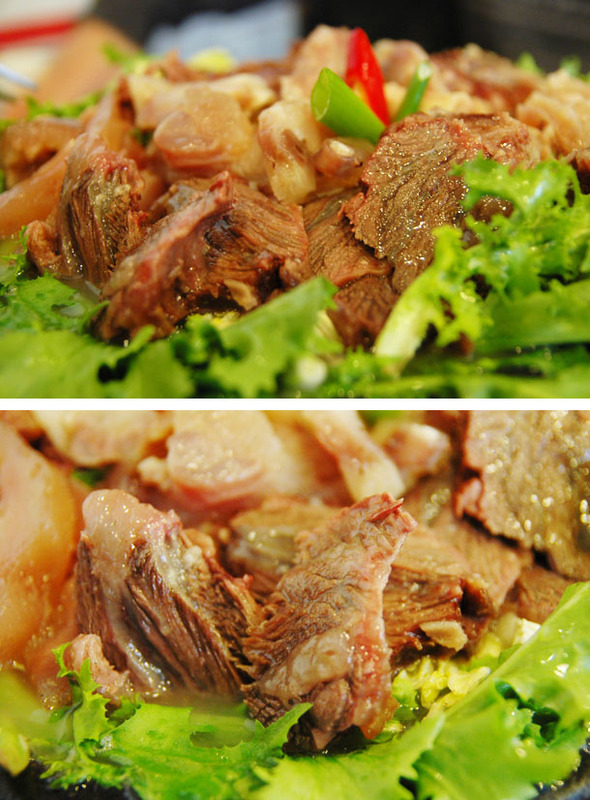 The top is various parts of high quality Korean beef, including: brisket, cow’s foot, oxtail, joints, tendons, and tongue. The second layer is lots of cabbage and lettuce, and the last layer is milky white soup of meat and veggies. The whole dish is kept warm by the radiating charcoal on the bottom. 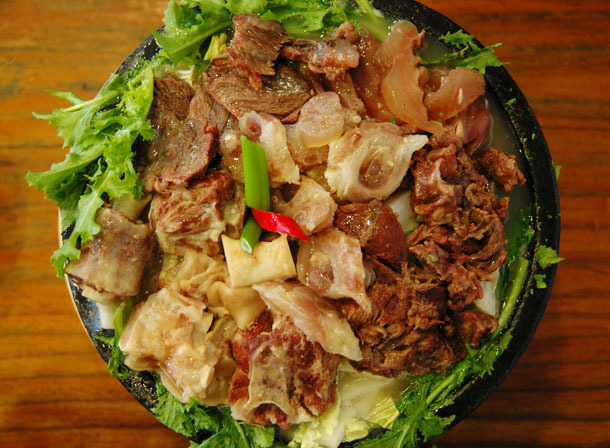 In Baeksong’s version of suyuk, the meat is exceedingly soft, tender, and juicy, despite having been boiled once. Somehow it managed to retain all the moisture and flavor without being greasy and fattening. The joints and tendons can be very tough if cooked improperly, but Baeksong’s is creamy and chewy. Surprisingly the cabbage in this dish tastes just as good as the meat itself. The cabbage is coated with the meat’s deeper flavors and it has been cooked until it melts into a silky, soft texture. Its sweetness is a pleasure to indulge in, when paired with the meat. After devouring the meat and vegetables, you’re left with a delectable broth – the honest essence of beef and veggies, with no other intruding flavors. Koreans consider local beef as the highest quality beef because it tastes better than imported ones. 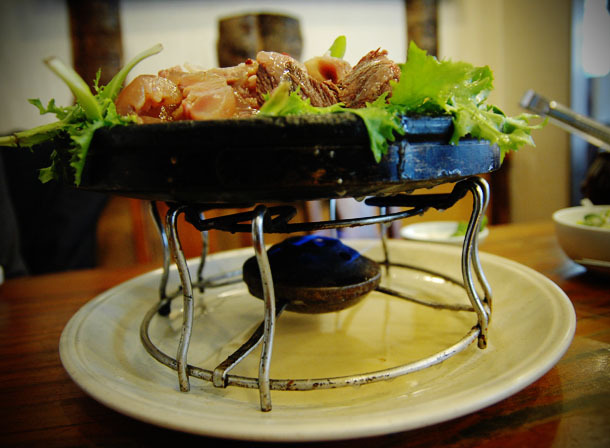 Baeksong claims to use only local, natural ingredients and premium quality Korean beef. And you cannot help but believe their claim when you taste their food. It’s open all the time, so whenever you feel like having a good bowl of beef soup or quality meat without grease and guilt, this is the place for you. This entry was posted in Seoul, Taste and tagged justine, taste. Wow…looks mouth-wateringly amazing! Great photos. Man, that looks so bomb. Yes, I just said bomb. OH Korea! I miss you!!!! OMG I miss Korean beef. Your family knows the best spots! That looks delicious! Any ideas on how to recreate that at home? Just found this video on how to make pork suyuk by Paul Schenk: http://borderlesskitchen.sexyeatz.com/watch_video.php?v=RG7278ADGUH6 It’s not beef suyuk, but since suyuk is really just boiled meat, I’m sure it’s not too different. But you get the idea: make a stock (I think you can be creative with this), put meat and boil, and serve with some veggies! I’m a little bit late to this party but in the spirit of better late than never, YUMMM!! Can’t wait to visit all these places when I finally make it over there.